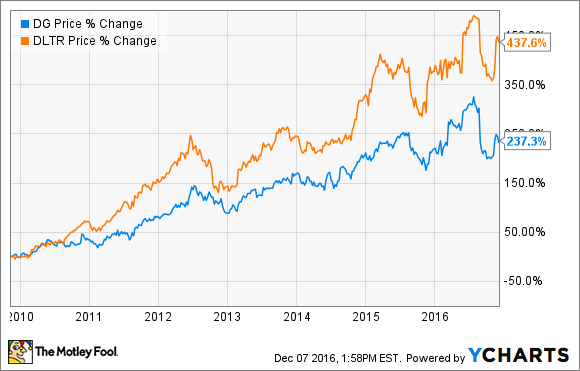 Dollar store chains Dollar Tree (NASDAQ: DLTR) and Dollar General (NYSE: DG) have been big winners since the recession, as the chart below shows. The bargain-basement retail format thrived in the aftermath of the recession as Americans hit hard by the financial crisis were forced to cut back on spending. Both companies expanded aggressively and engaged in a bidding war over Family Dollar, which Dollar Tree eventually won. Now, however, there's evidence that the good times are coming to an end. Let's take a closer look at why. Despite grossing more than $40 billion in combined annual revenue, Dollar General and Dollar Tree aren't each other's biggest rivals. The 800-pound gorilla in the low-priced retail room is Wal-Mart (NYSE: WMT), with more than $300 billion in domestic sales. For much of the period when the dollar store stocks were soaring, Wal-Mart was struggling -- comparable sales fell for several quarters, and the company failed to invest in its stores, with customers complaining that they were dirty and items were often out of stock. That's all changing now. Wal-Mart has made a concerted effort to clean up its stores and invest on price (corporate-speak for lower prices), and it's already having an effect on its discount rivals. Wal-Mart shuttered its imitation dollar store chain Walmart Express, selling some of the locations to Dollar General, and instead cut prices on competitive items at stores near its dollar-store rivals. The move had a noticeable effect on the dollar store chains, as both stocks tumbled in August after issuing disappointing earnings reports. That pattern should continue into next year as Wal-Mart is scaling back on new store openings to focus on things like improving in-store experience, price investments, and expanding its popular grocery pick-up program. It’s best to err on the side of caution when buying cords and cables at the dollar store. Some merchandise may not reach safety requirements or may be prone to breaking. Toys run the same risk as cords, so consider buying toys from the clearance aisle at a retail store if you’re on a tight budget. Tools at the dollar store are typically of substandard quality, so you may want to find a discounted set at a hardware store instead. Medicines at the dollar store may be missing ingredients, so you’re better off buying at a drugstore to ensure the highest quality. Similar to medicines, we recommend purchasing vitamins at your local drugstore. 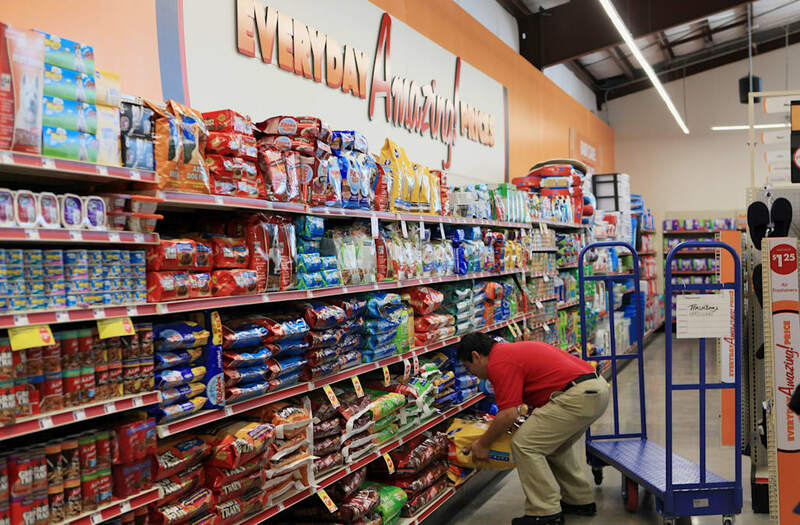 In addition to medicines and vitamins, you run the risk that dollar store pet food is missing ingredients and of lesser quality. Soda at the dollar store is often packaged in only 1L bottles, so you’ll most likely find a better bargain at a grocery shop or wholesale store. Similar to soda, gum is often sold in smaller packaging at the dollar store, so you’re better off buying in bulk at wholesale store. You risk knock-offs to name brand versions that are less efficient. Dollar Tree and Dollar General have more stores than any other retail chain in the country, with more than 14,000 and 13,000, respectively, and the two continue to expand rapidly. Dollar General plans to add 1,000 stores next year on top of 900 this year. Dollar Tree, meanwhile, has increased its store count by more than 400 stores in the first nine months of the year, and plans to grow its square footage by 4% for the full year. Amidst the rise of e-commerce, other retailers are taking a different tack. Wal-Mart has scaled back its new store openings next year to the fewest since the 1990s. Department store chains like Macy's are closing stores by the dozens and selling off real estate to consolidate. As more shopping takes place online, many retailers have found they're getting a better return by investing in e-commerce rather than brick and mortar locations. There's evidence that overexpansion is already having an impact on bottom lines. Dollar General reported its first decline in comparable sales since its 2009 IPO last week. The key metric fell just 0.1%, but it could portend an extended swoon in sales at established stores as management cited an ongoing "challenging retail environment." Dollar Tree posted a comparable sales increase of 1.7% in the same period, but even that represents a deceleration from 2.1% the year before, and the figure has been trending downward over the last two years. On a sales per square foot basis -- the best measure of how efficiently retailers use their space -- both companies are well below the retail average with only about $200 in sales per square foot. Both companies also saw that metric decline in the last quarter. By contrast, Wal-Mart's U.S. stores generate more than $400 in revenue per square foot. Based on those numbers, the two dollar store chains would be better off investing in store improvements or e-commerce rather than new stores. Since each company already has about one store per 25,000 Americans, the marginal benefit of each new store is minimal as many consumers already live near one of them. The factors that led to the companies' boom following the recession are starting to reverse. Wage growth is set to be its highest this year since the financial crisis, and the economy is approaching full employment. The number of Americans on food stamps or SNAP benefits have also declined since their post-recession peak of 48 million to about 44 million, and that streak is likely to continue. In other words, more Americans can now afford to shop at places other than dollar stores. Dollar General even cited the reduction in SNAP benefits as a reason for its decline in same-store sales, and Wal-Mart has used the excuse in the past as well. Food deflation has also put pressure on grocery sales across the board, including the dollar chains. The stocks' valuations remain reasonable as earnings growth mostly kept up with the stocks' surge in recent years, but the factors that were favorable to them following the recession are changing. 2017 could be the first down year that these stocks have seen in a long time.